Tim Cook has dropped another hint that new, never-before-seen types of Apple products are on the way. In an interview with the Wall Street Journal, Cook said, "there will be new [product] categories we're not ready to talk about it, but we're working on some really great stuff." When prodded on the rumors of a 12.9-inch larger iPad, he declined to comment. Instead the Apple honcho only said that any "reasonable" person would consider what Apple is working on a new product category. From Cook's answers, the outlook on Apple's future device portfolio is about as clear as muddy water. By saying the new products would interest any reasonable person leaves speculation open to anything from a Apple Watch to an Apple iTV set, or even some sort of gaming service. The real question in consumers and investors' minds is whether Apple can still innovate. It's clear Apple has to move out of its comfort zone and develop more devices than the music players, computers, smartphones and tablets we're used to seeing from Cupertino. Early reports suggest Apple is already making big shakeups with its next iPhone, which will feature an even bigger departure than the half-inch screen extension we saw on the iPhone 5. The iPhone 6 is rumored sport a 4.8-inch screen, making it Apple's largest yet. We may also see a new phablet sibling as the company's is said to be working on a handset that breaks the 5-inch barrier. 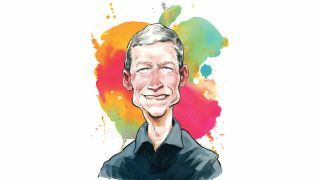 Given Cook's reiteration that Apple is planning to enter new product categories and not simply do something new with its current products, we have a feeling Cupertino may still have a few tricks left to wow us. Does Apple still make amazing products? Find out in our review of its latest tablet, the iPad Air.